New York! What can we say about food in New York city apart from the fact that you can get absolutely anything and everything you can imagine there. I think our list of keto must eats in New York before our trip was longer than the list of attractions we wanted to visit. 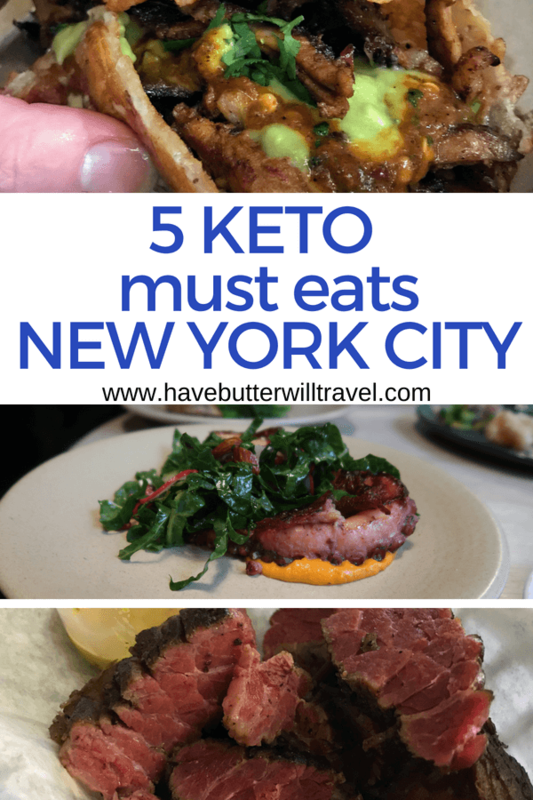 We have done the hard yards for you and narrowed it down to our top 5 keto must east in New York. We have been hearing about the cheese shell tacos here for a while and were so excited to finally be able to try them. They definitely did not disappoint. I was nervous about placing the order as the cheese tortilla is not displayed on the menu. There was no need to worry. When ordering just ask for the cheese tortilla and then choose your fillings. We opted for one of each of the steak, pork and chicken. All were equally amazing. The cheese tortilla is like nothing we have been able to create at home. When we make cheese shell tacos they are a hard shell. These are a soft tortilla and are much closer to a flour or corn tortilla. We really wished we were able to go back for a second meal, but there are just so many awesome places to eat and visit in New York City. 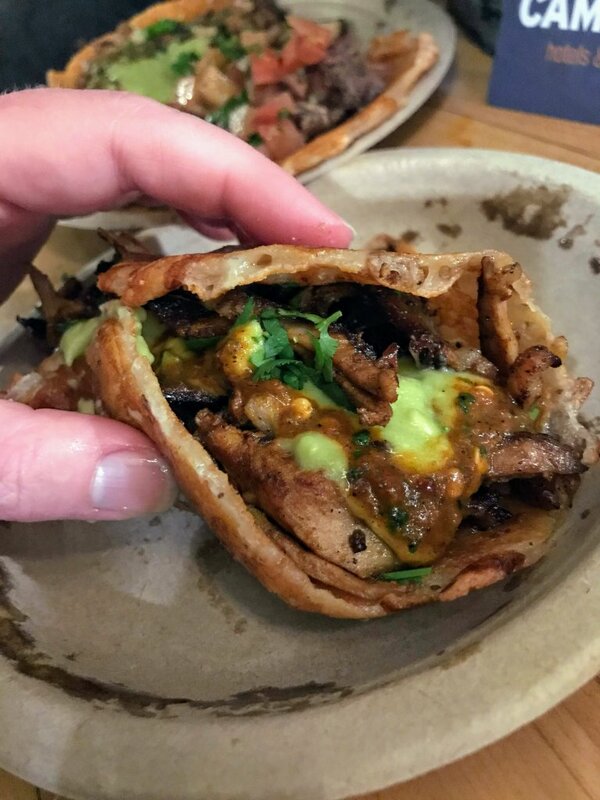 We went to Chelsea Market for the tacos from Los Tacos No1, but we found so many excellent keto options here. Ronnybrook Dairy – A local Hudson Valley dairy farm specialising in products made on the farm, such as butter, eggs and yoghurt. Saxelby Cheesemongers – NYC’s premiere purveyor of American artisan cheese and dairy products. The Nut Box – All the nuts! Fresh, savory, wholesome, natural and organic nuts varieties. Spices and Tease – Dan enjoyed an unsweetened ice tea here and they carry over 180 exotic teas if you love tea like we do. The Lobster Place – An amazing array of fresh and prepared seafood, the lobster salad looked delicious! 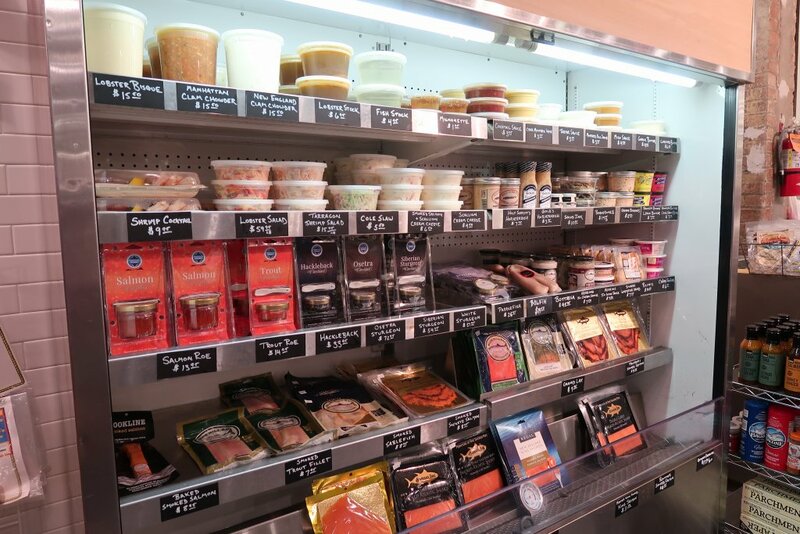 Dickson’s Farmstand Meats – Rotisserie chickens, house-made hot dogs, bone broth, roasted cauliflower and housemade kimchi are just a few of the great keto options they have here. The Green Table – One of the NYC’s first farm-to-table restaurants, enjoy delicious dishes that demonstrate a commitment to seasonal, regional cuisine. This was my favourite keto meal in NYC. We met a friend for dinner and ordered a bunch of keto small plates. We ordered tuna tartare, confit chicken wings, grilled octopus, smoked kielbasa sausage, salt and vinegar pork rinds and italian sausage. All of the food we ordered was delicious. My favourite dish was the octopus. 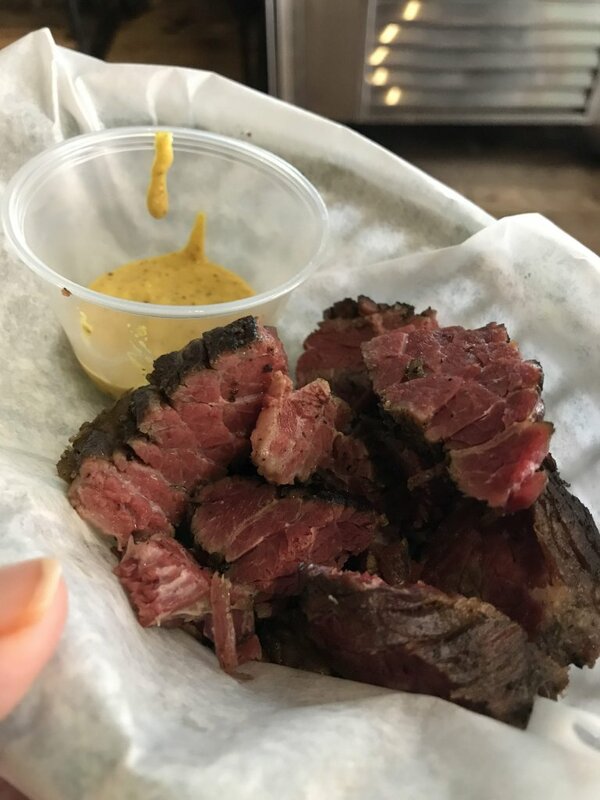 If you are in NYC find time to get to Cannibal for dinner and enjoy the fact that you can easily order off the menu without needing alterations for great keto options. 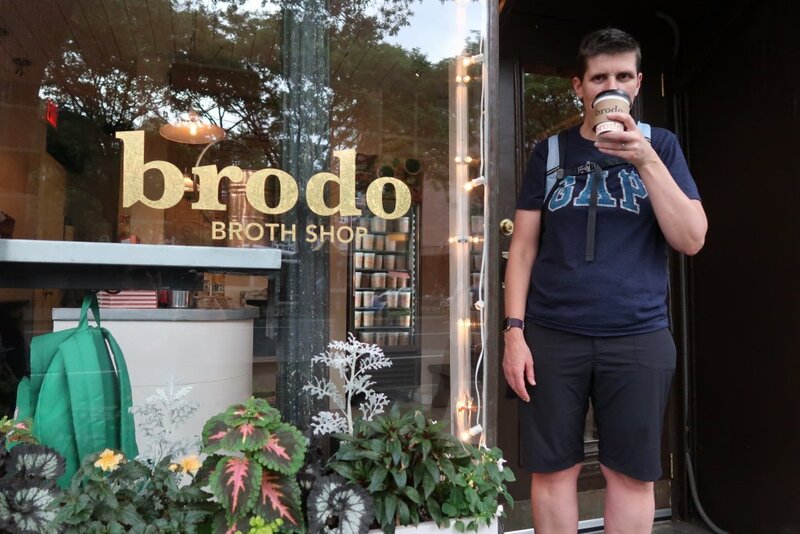 We headed to Brodo after our delicious tacos, so we weren’t really hungry, but we loved the thought of a bone broth bar and wanted to order some. The bone broth options are chicken, beef, hearth (a combination of chicken, beef and turkey) or seaweed and mushroom. We ordered a small chicken broth and it was delicious. We love the idea of being able to choose your add ins. Imagine a place where you can add egg yolk, bone marrow, grass fed butter, coconut milk or coconut oil to your bone broth. We were also very intrigued by the cold broothies. A broth smoothie. We had never heard of this idea before. We asked them about them and they commented that they are a very popular choice in Summer. We went to Hu Kitchen for breakfast before starting a food tour, so we didn’t order a big breakfast. We ordered 2 eggs with the paleo biscuit, bacon and the chicken sausage to share. It was great that we could order a biscuit that was grain free and made with almond flour. Hu Kitchen also have some great drink options including crack coffee with coconut oil and grass fed butter. 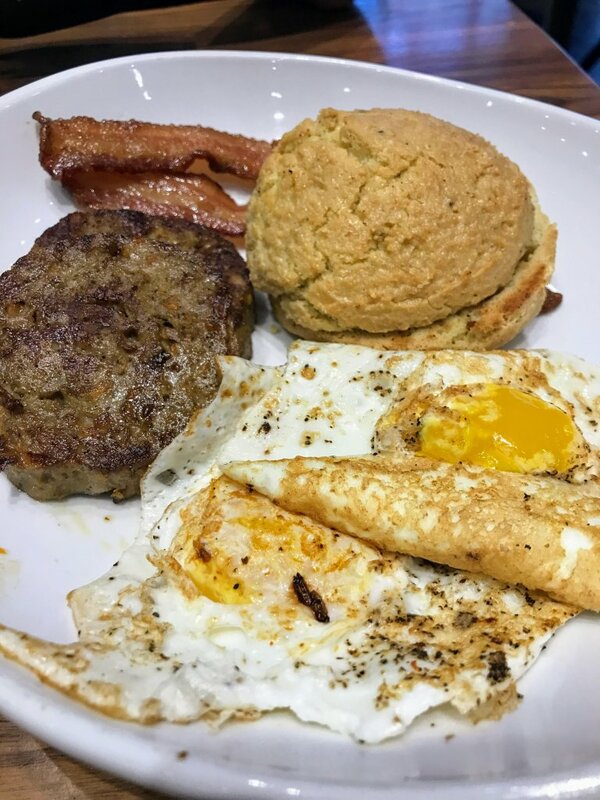 Hu Kitchen is a great option for keto and low carb and we would definitely recommend it for breakfast or lunch. The staff were all really helpful and they are able to easily advise you the ingredients in all their housemade food. They specialise in high quality ingredients, so you can eat here with piece of mind. When travelling we love finding grocery stores and spend time wandering around looking at all the different foods that we can’t get access to in Australia. We found the Westerly Natural Market after seeing a show on Broadway on our last night in New York. We found many different keto choices and recommend you allow plenty of time to wander around and enjoy the experience. 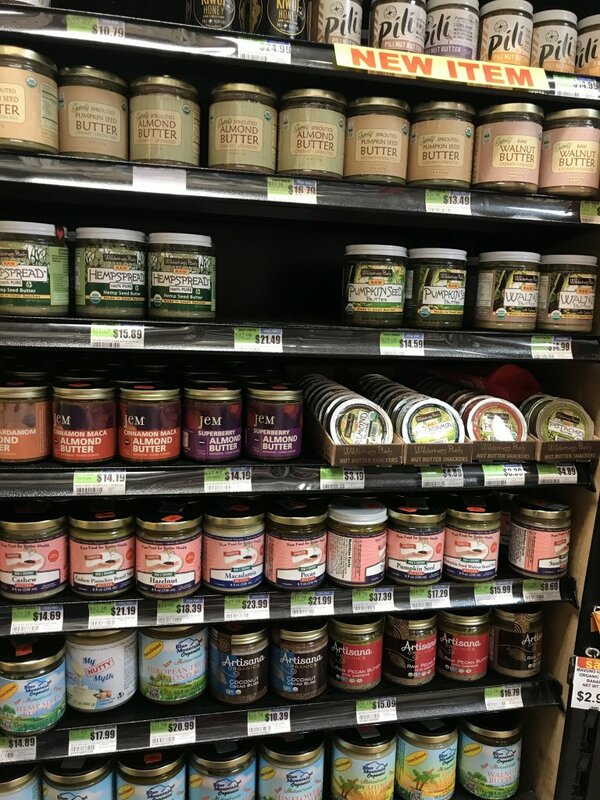 Their nut butter section alone was phenomenal! 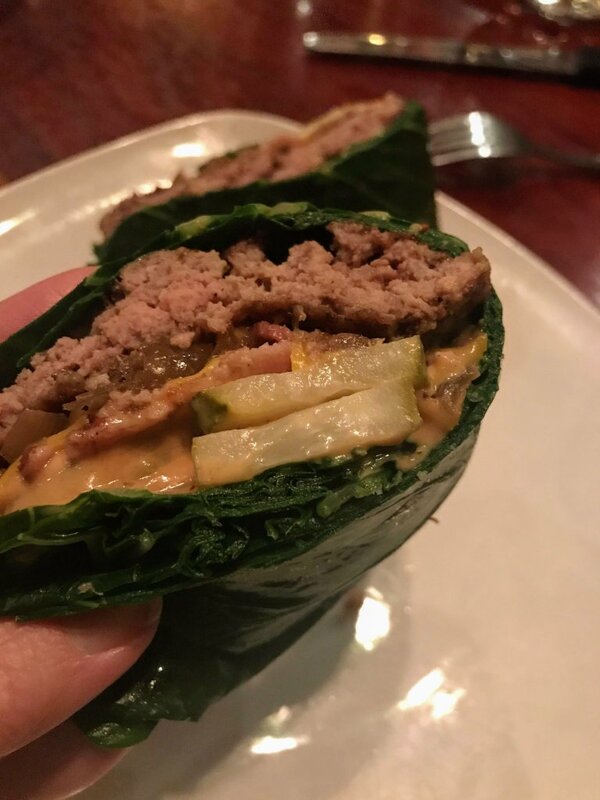 We love that Bare Burger offer a collard green wrap as their low carb “bun” option. You can choose any of their burgers and wrap it in the collard greens for a keto option. We ordered the American, the Buckaroo and a side of crispy brussel sprouts with parmesan and bacon – YUM. You can order a bunless burger at most places in New York very easily, but sometimes you want to be able to pick the burger up and eat it. Head to bare burger for a delicious burger you can eat with your hands. We went to Harry and Ida’s as part of a food tour we did. The pastrami was amazing. I love deli meats like pastrami and this was some of the best I have had. We wanted to get to one of the other deli meat places while we were in New York, but we just ran out of time. The best thing about Harry and Ida’s is you could order the meat by the pound and it didn’t have to be served on bread. The perfect keto option. Dig inn has 19 locations throughout New York city and would be a great option for a quick lunch while out exploring New York city. We didn’t get a chance to eat here on this trip. There are plenty of keto options with the market bowls and market sides and a greens base. 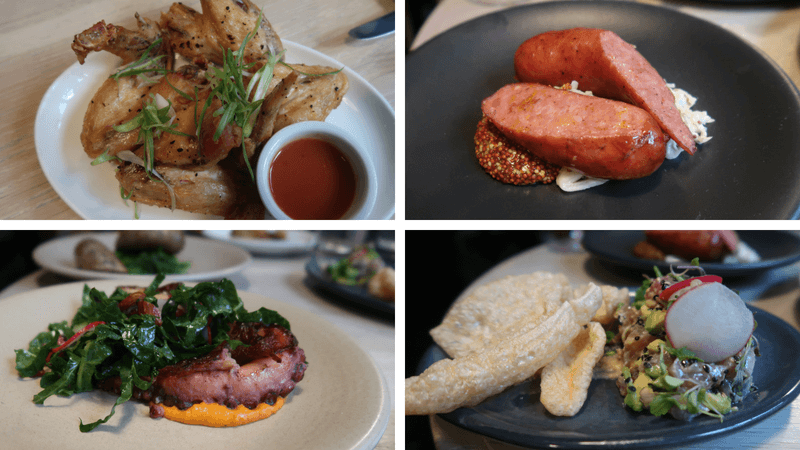 We loved exploring the keto food options in New York city and really enjoyed some delicious meals in New York City. There are so many places to eat in the city and I am sure there are many more keto options. I wish we had had more time here. I would have loved to have gone to a BBQ place, but we just didn’t have time. We will just have to go back. We would love to hear about your favourite keto eats in New York City. What did we miss? What places do we need to add to our list for our next visit? Let us know in the comments below. 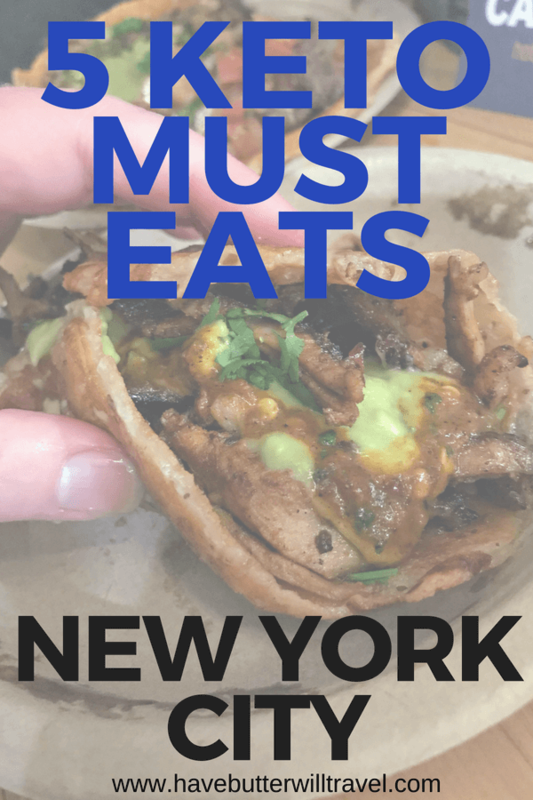 If you love this keto must eats in New York, check our other keto eats locations.